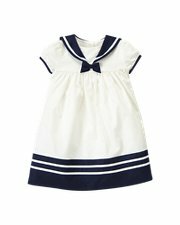 The other day I went into Janie and Jack to return something for Baby Nautical. Nautical overload! Run don't walk into your local store (or the website)! Uh Oh, that's dangerous! I have a store credit to J&J AND P's 1st birthday party is going to be nautical/fish themed! I may need to check it out this week! Thanks for posting! ahh soo cute!! Hope they will have these in 2+ years when I decide to have a baby hahaha...or maybe it comes in my size?